String art is a popular trend in crafts and home decor. 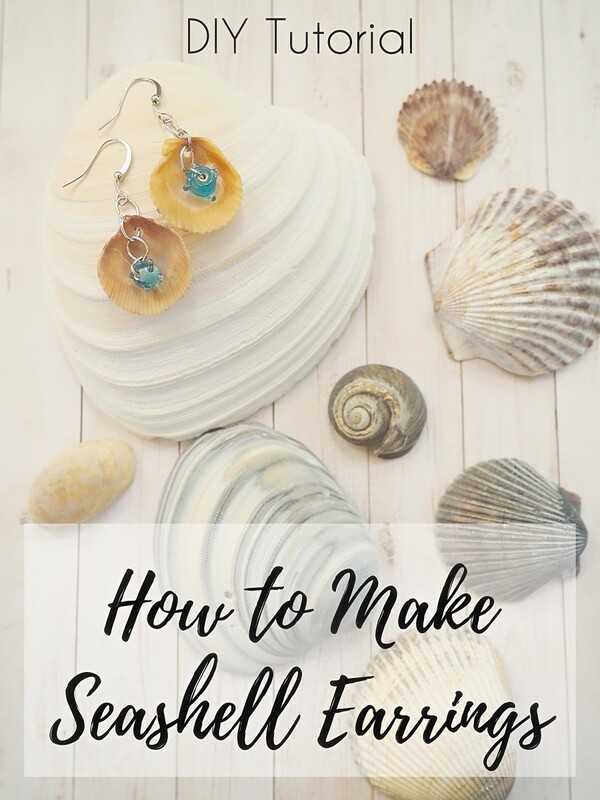 Now you can use this technique to make unique and personalized jewelry items like brooches and pendants. 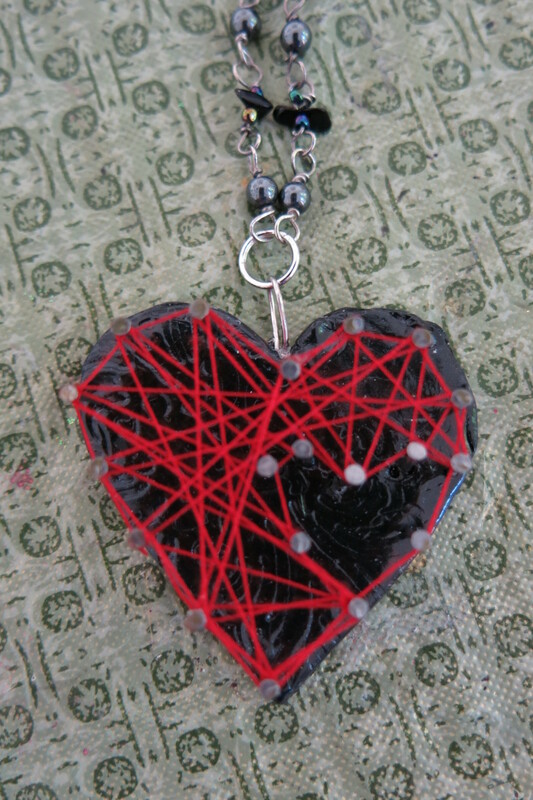 This fun tutorial uses polymer clay, some basic tools, and thread to make this eye-catching pendant or brooch. 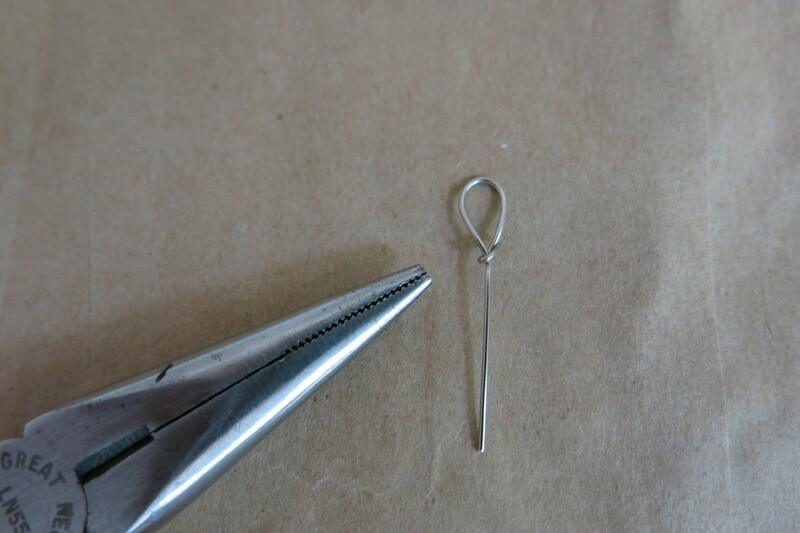 Note: Your finished pendant or brooch will feature thread wrapped around pins, and will be delicate. The finished item will hold up to regular wear, but is not meant to be played with or pulled on. Please wear it with pride, but with some tender care. thread, embroidery floss, darning thread, or thin twine - there are many threads you can use depending on what size you make your pendant or brooch. Be sure to choose a color or thread that will contrast nicely with your clay. 20 to 30 common pins or tiny wire brads - common pins with a flat head will work nicely, but will need to be cut in half, otherwise you can use tiny brads. 1. Choose a recognizable shape for your pendant or brooch. Some ideas for shapes to use would be a heart, a star, your initial, the outline of your home state, simple animal shapes, etc. You can go online to find a line drawing of your shape to use as a template when cutting out your shape. 2. Print out your template to be about 1 to 2 inches in size. Anything smaller will be difficult to put pins in and wrap with string. 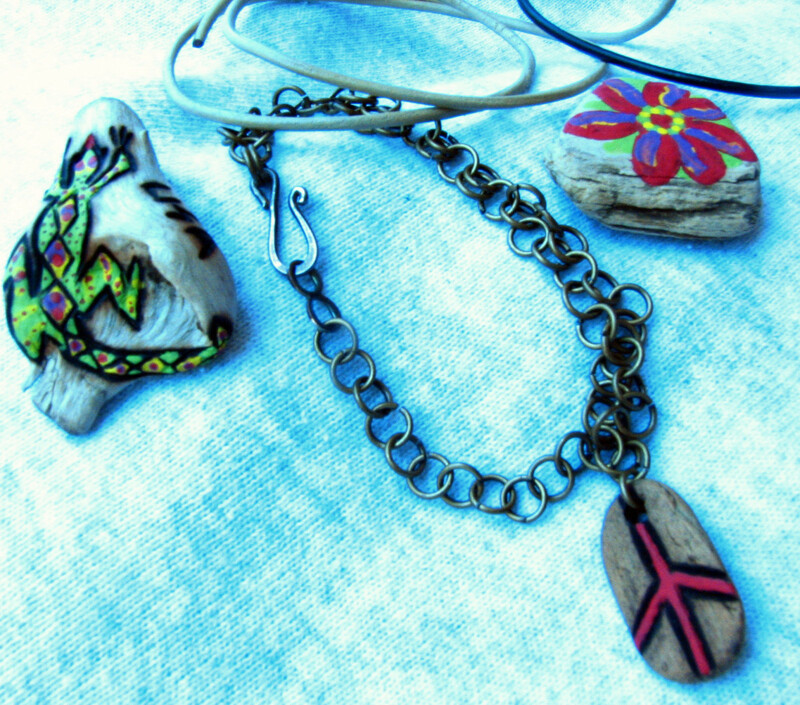 Any anything much larger might be clunky to wear as jewelry. 3. 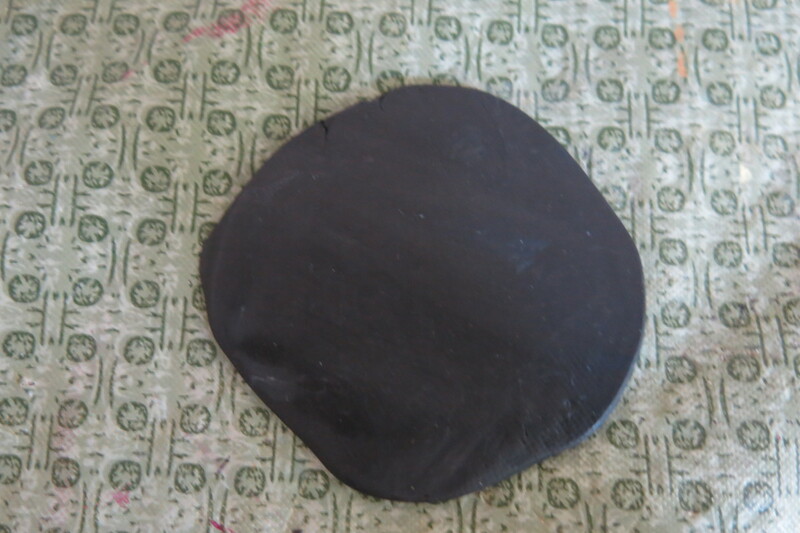 Next, take about 1/2 of your block of clay and roll it out to be a little bit thicker than a quarter coin piece. 4. 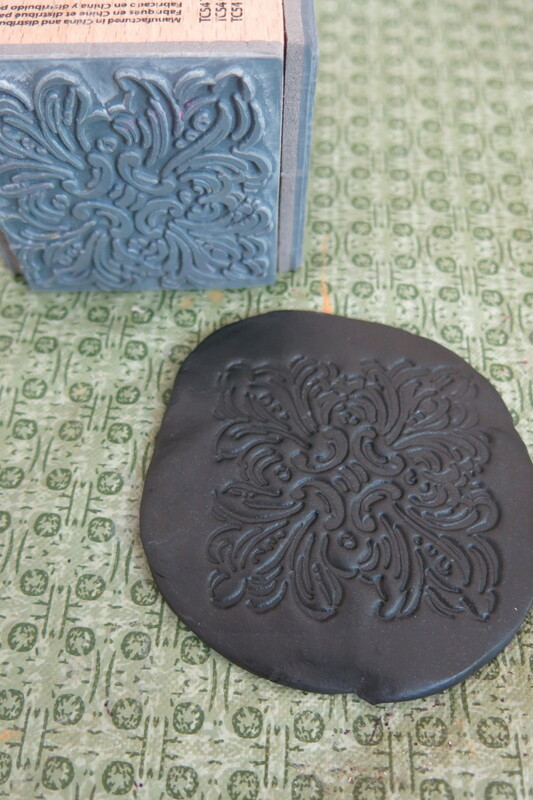 (Optional) Use stamps or interesting buttons to stamp a design in your clay. This will create a background behind your string shape. Be sure to press your stamps or buttons firmly and evenly into your clay. 5. Now using your template, trace and cut your shape out of your clay. Gently use your finger or cutting tool to smooth the outside edge of your shape. At the same time, try to avoid touching your clay too much. Try to keep it as flat as possible and avoid leaving any fingerprints in your clay. Do not bake your clay yet. 6. 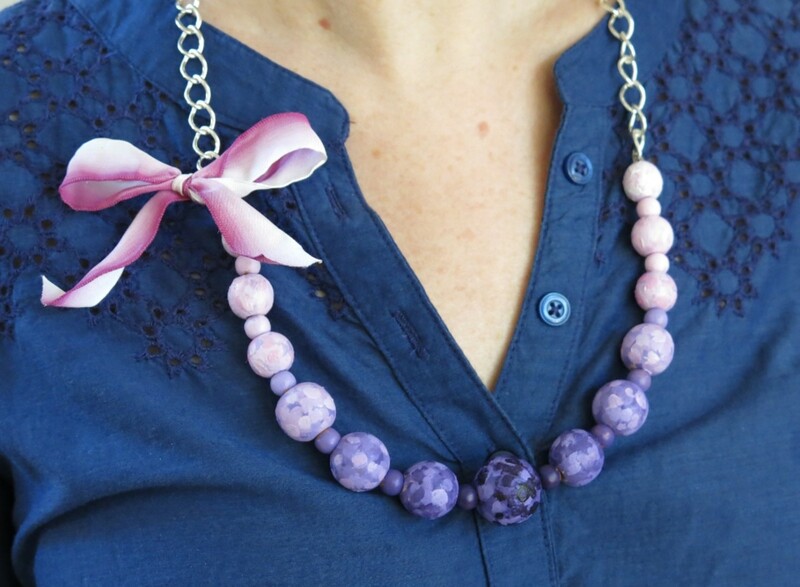 If you are making a pendant for a necklace, you will need to attach a loop to your pendant for hanging (if you wish to make a brooch, you can skip this step). 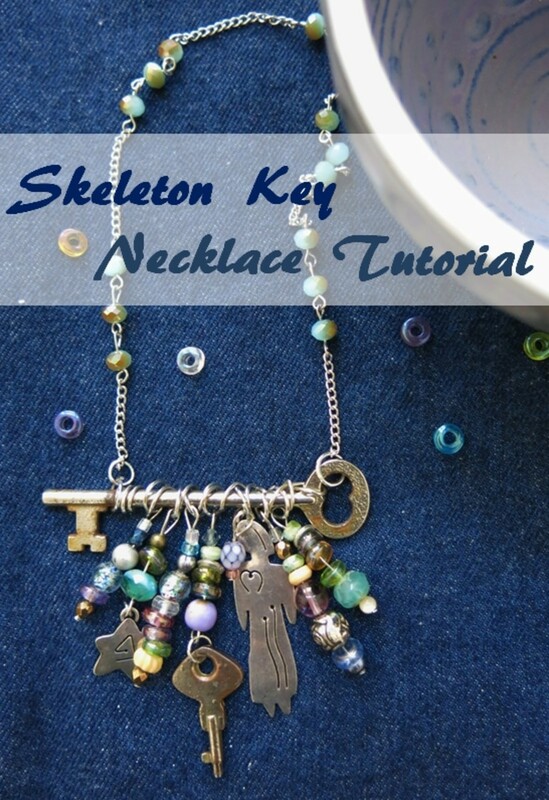 To make a loop for your pendant, you can either use a eye pin or a head pin. A eye pin is a long pin with a open ring at one end. A head pin has a little stopper at the end instead. You can also make a loop with a head pin by cutting off the stopper and twisting the end into a loop using needle nose pliers. Whether you use a eye pin or a head pin to make your loop, make sure the length of your pin is at least 1/2 an inch long. Then push the pin end through the side of your clay at the top of your shape. Be careful not to have a pin come through the front or back of your clay shape. 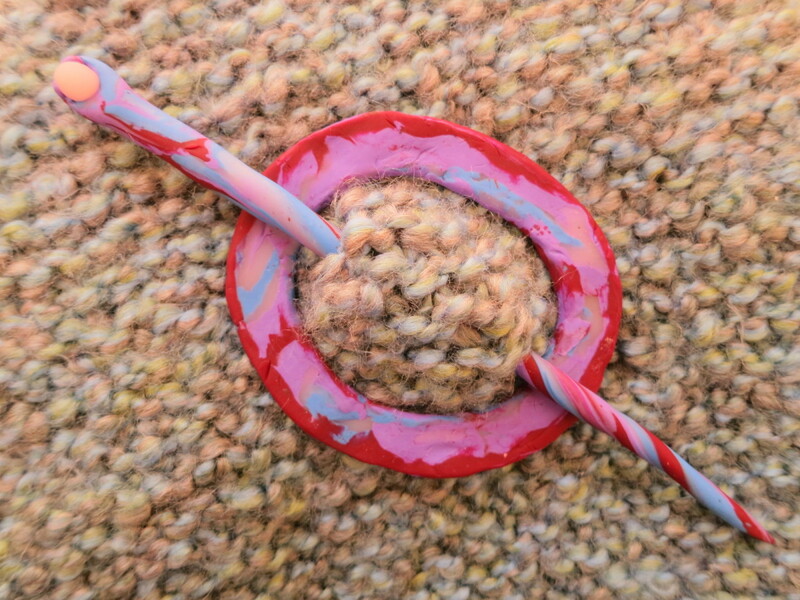 Push your pin until your loop sits against the side of your clay. Twist your loop so that it faces forward. 7. 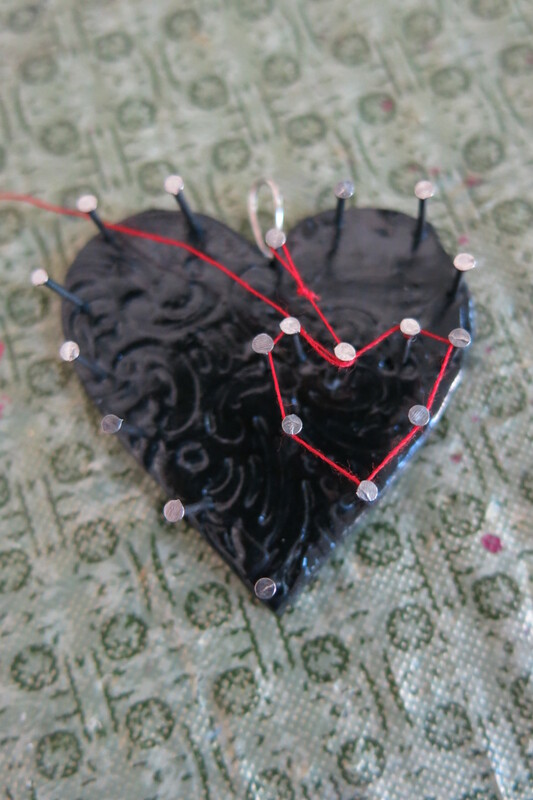 For the pins to create your string art, you can either use tiny wire brads or basic common pins. If your clay piece is very small, the wire brads might seem a bit big. However, if you use common pins, you will need to trim them down. 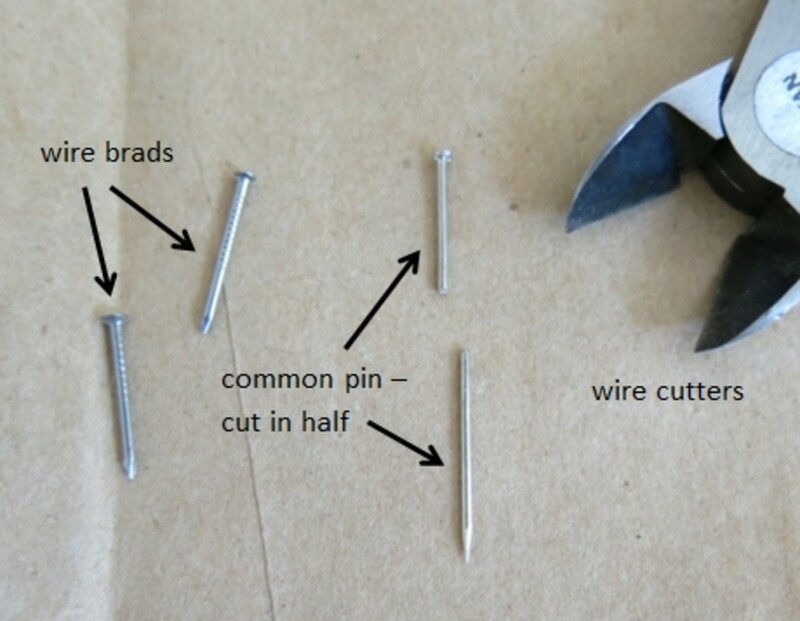 To trim your common pins, use wire cutters to cut them in half or shorter. Be careful when cutting your pins - the pieces might fly in all directions. I found it helpful to work on an old towel. I positioned my wire cutters where I wanted to cut my pin, then wrapped my hand in the towel to contain the pieces while I applied pressure. 8. 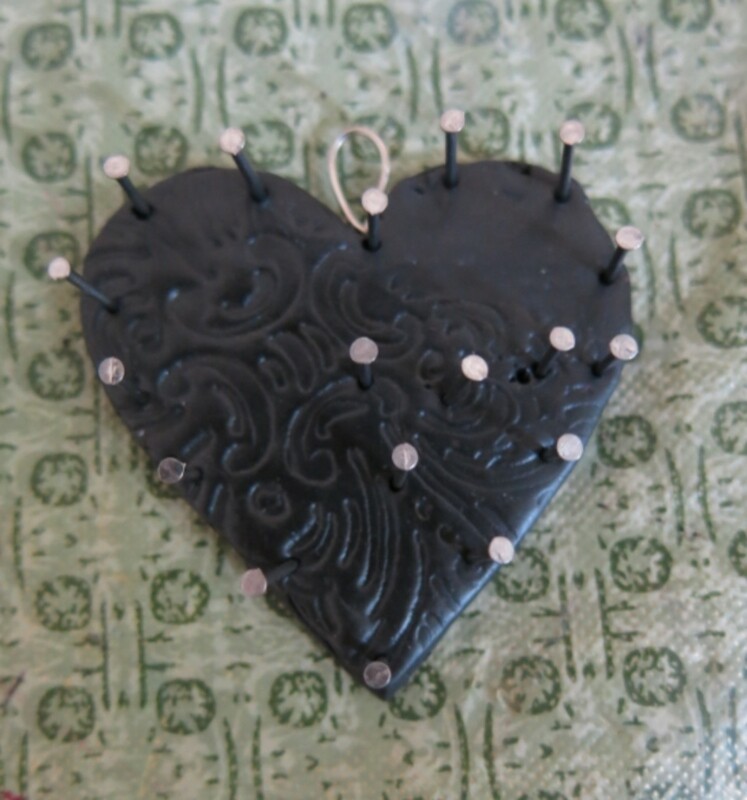 Now you can start positioning your pins or wire brads to create the design for your string art. I made a heart with a smaller heart inside, but this is optional. 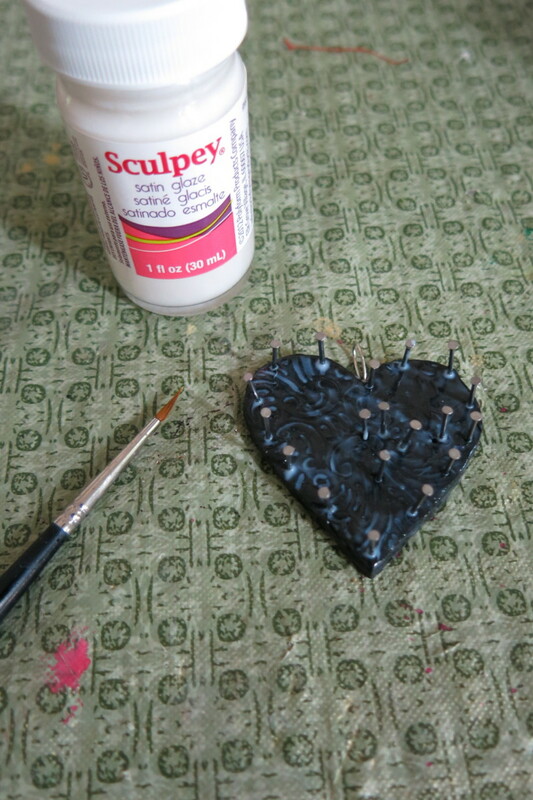 Push your pins or brads deep enough into the clay so that they stay in place, but try to avoid them coming out the back of your piece (though if they do, you can just glue a piece of felt on the back of your clay after it has been baked). Work slowly and try to push your pins in as straight as possible. Do not place your pins or brads too close to the edge of your clay. When placing your pins, be sure to define the outside edge of your shape. Try to place a pin in every corner and point. However make sure there is enough space between your pins or brads that you will be able to wrap your thread or string. Think of symmetry when placing your pins (if possible), so that you have the same number of pins on each side of your shape (see photo above). 9. Now bake your clay according to the manufacturer's directions. Then let your clay cool completely. 10. (Optional, but recommended) Once your clay has cooled, paint on a thin layer of glaze or varnish that's made for your type of clay. If your pins are pushed deep enough into your clay, they should stay in place. However, a layer of varnish or glaze will help glue them in position. 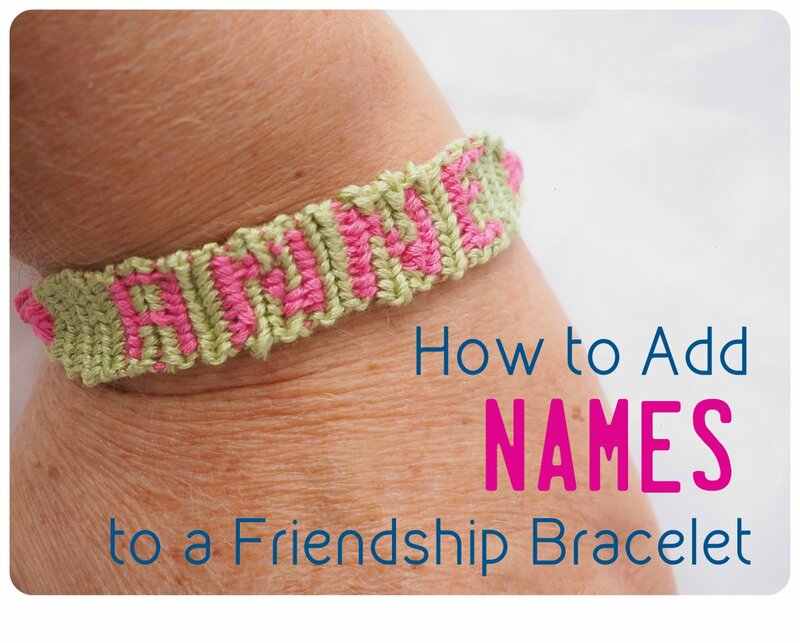 It will also highlight your stamped background if you added one. 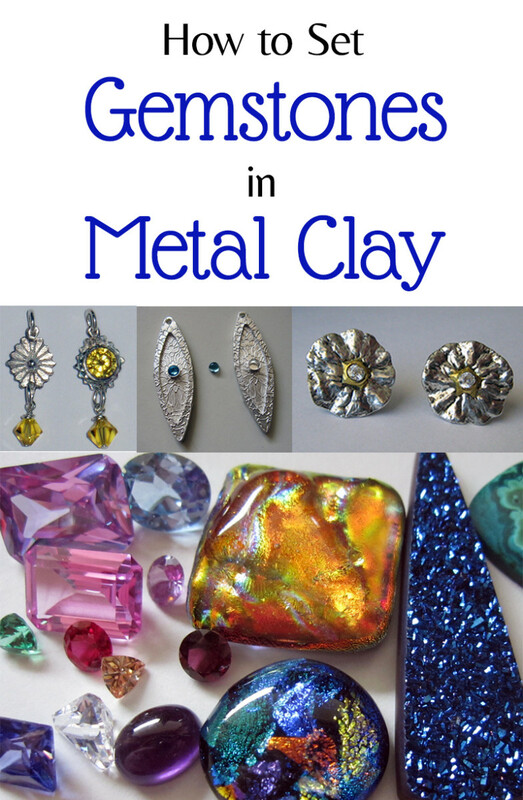 Click here for a list of the different types of varnishes that can be used with polymer clay. 11. Once your glaze has dried, take your thread or twine and tie a small loop at one end that is just big enough to fit over your common pin or wire brad. 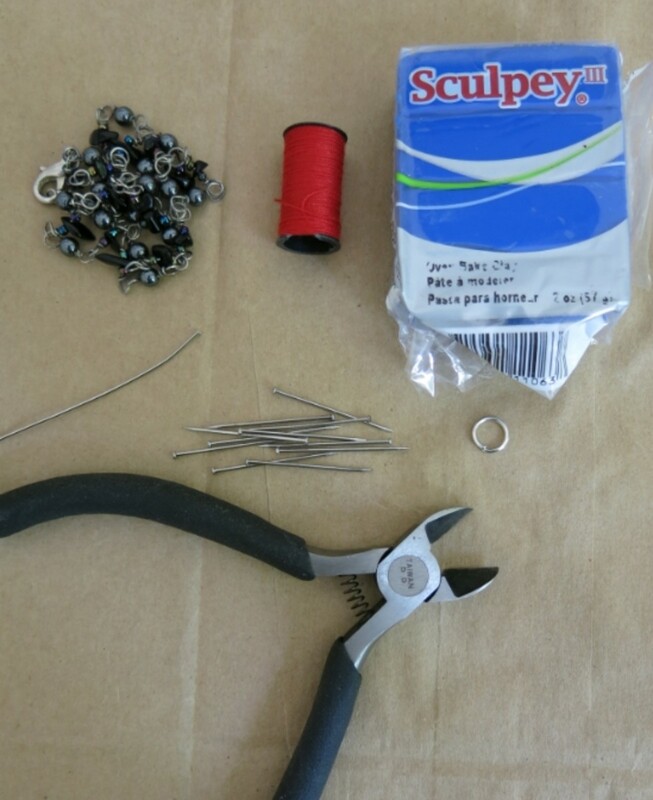 Cut off any tail that remains after making your loop so only the length of your thread remains. 12. You can begin at any corner to start to wrap your thread around your design. I started at the top center of my heart, then I outlined my smaller heart. When wrapping, be sure to bring your thread all the way around each pin (360 degrees) before moving on to the next pin. Keep the tension on your thread as you work, but don't pull too tightly. 13. 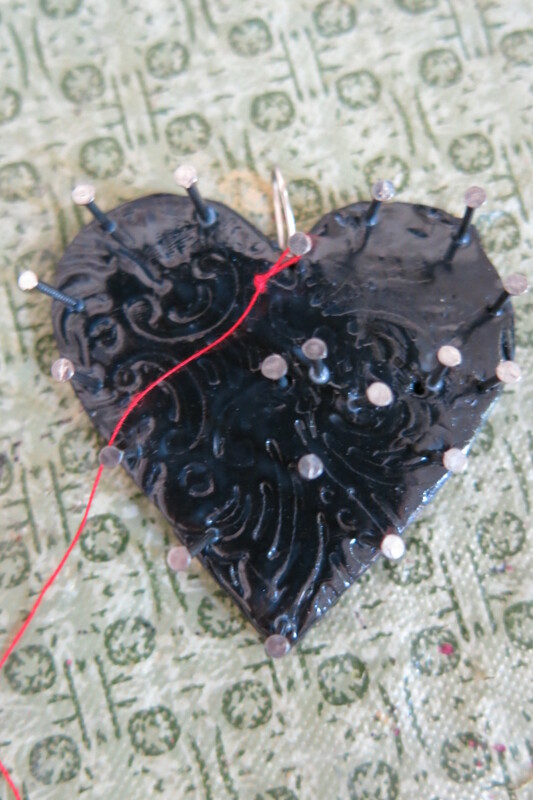 After wrapping my smaller heart, I wrapped the thread back and forth between my inner heart and my larger shape in some type of pattern. Wrapping your thread can take a lot of patience, but the final result is worth it. 14. 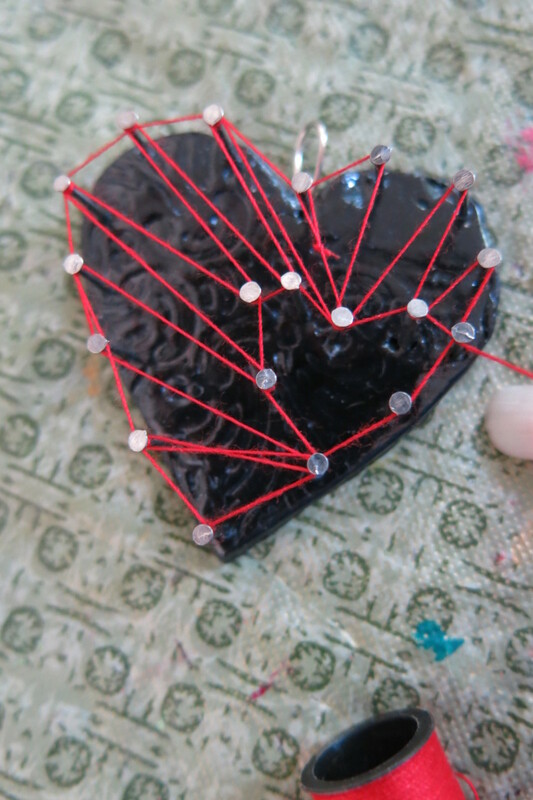 Then I continued to wrap my thread around my pins to fill in my shape and make an interesting design. It may take a couple of tries to get your pins and design wrapped in a way that appeals to you. With my heart shape, I was careful not to fill in my inner heart so that it remained empty and my background design showed through. 15. 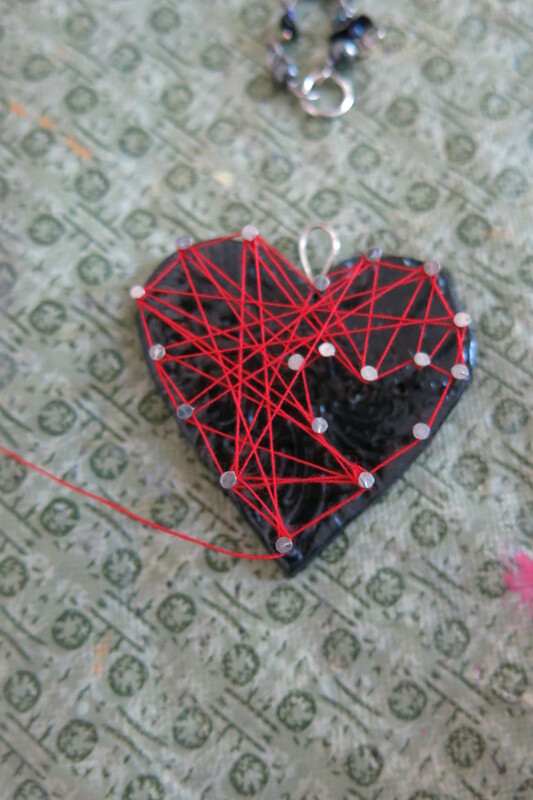 When you are happy with your string art design, wrap your thread around your last pin a few times. Do not cut your thread yet. Hold down your remaining length of thread with some tape. 16. Take some super glue or some clear-drying craft glue and put a small dot on the side of each pin to adhere your thread in place. If you can't put glue on your inner pins, it's okay. But be sure to glue your thread on all of the pins on your outer edge and the last pin you wrapped. Let your glue dry completely, preferably overnight. Then cut off your remaining tail or thread as closely as possible. 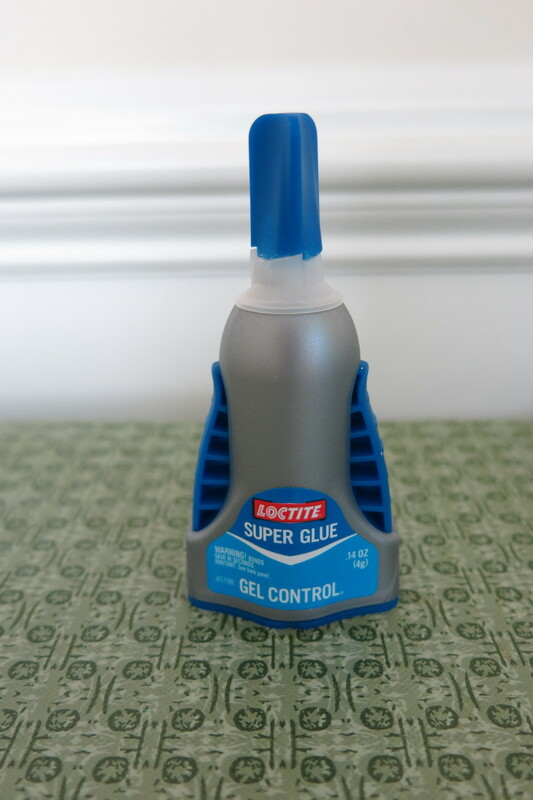 You can put another spot of glue on this end too. 17. 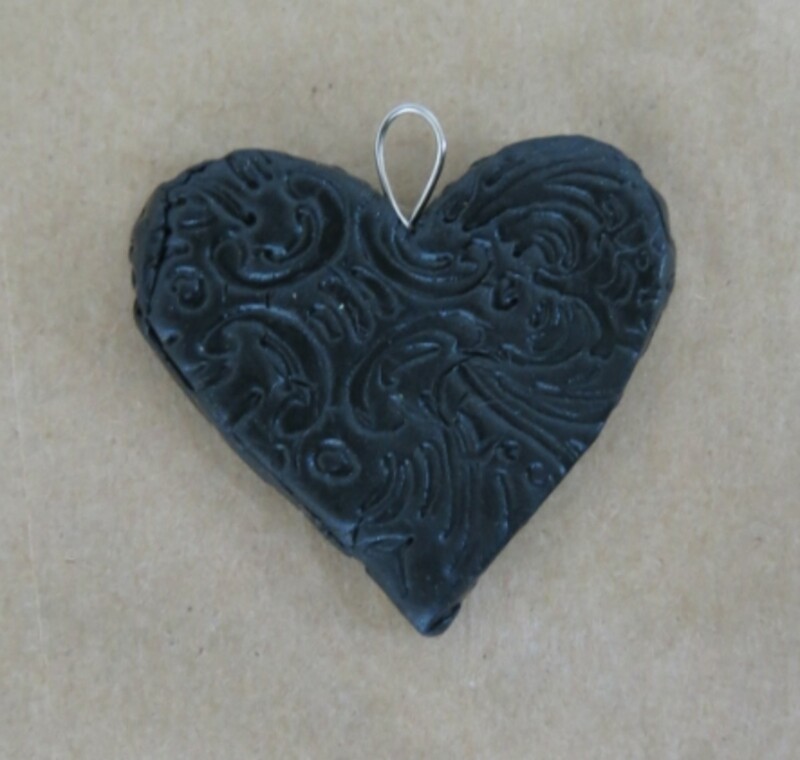 If you are making a pendant, you can also put some glue where your metal loop meets your clay to ensure it is attached. 18. 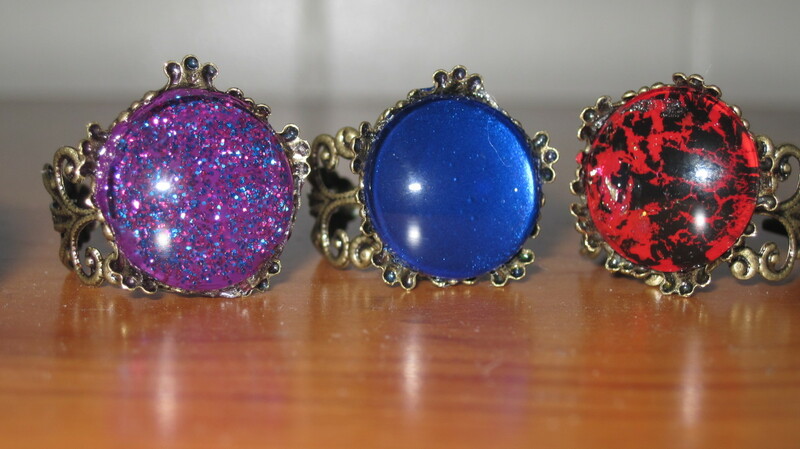 When your glue is dry, you can finish your jewelry piece. If you are making a pendant, use your needle nose pliers and a jump ring to attach your pendant to your necklace chain or cord. 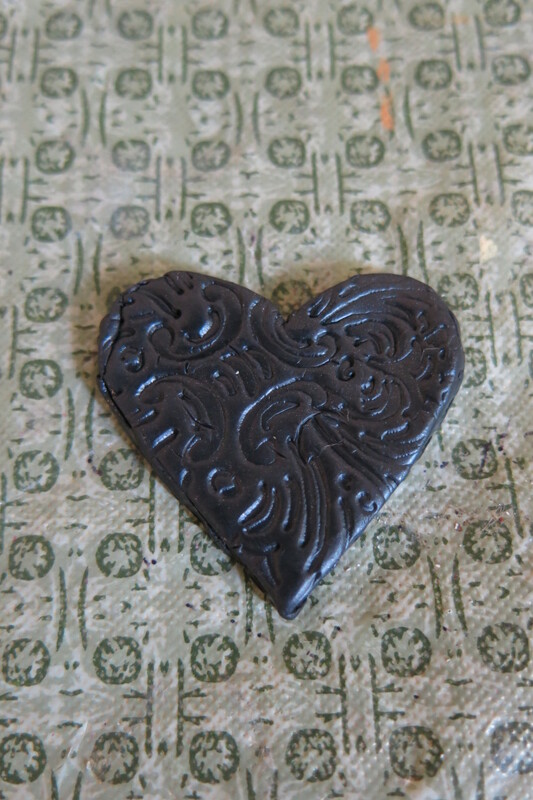 If you are making a brooch, use some super glue or clear-drying glue to attach your pin clasp to the back of your clay shape. Be careful when handling your string art as you attach your jewelry hardware. Thanks, Jill! This pendant was fun to design and make. I get a lot of comments on it. I hope it inspires you to try your own string art project. Thanks for reading and commenting! So clever and beautiful. 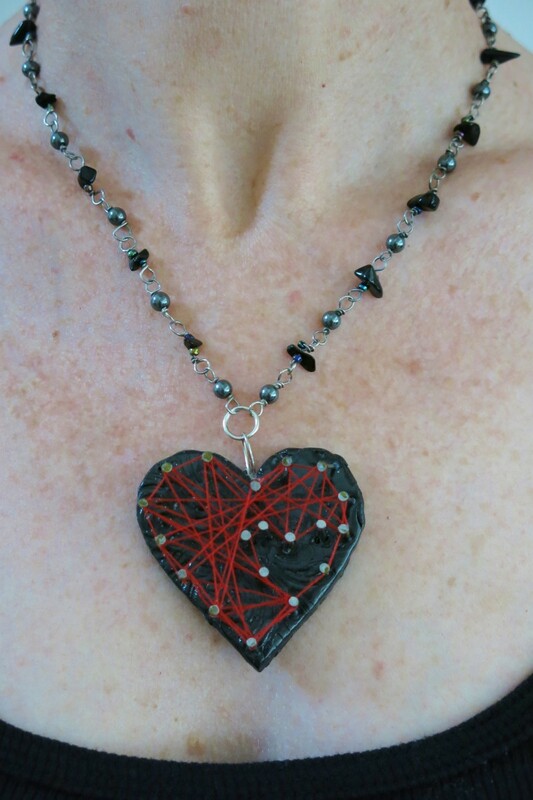 It's amazing to me how you made this from clay, pins and thread. Thanks, Heidi! 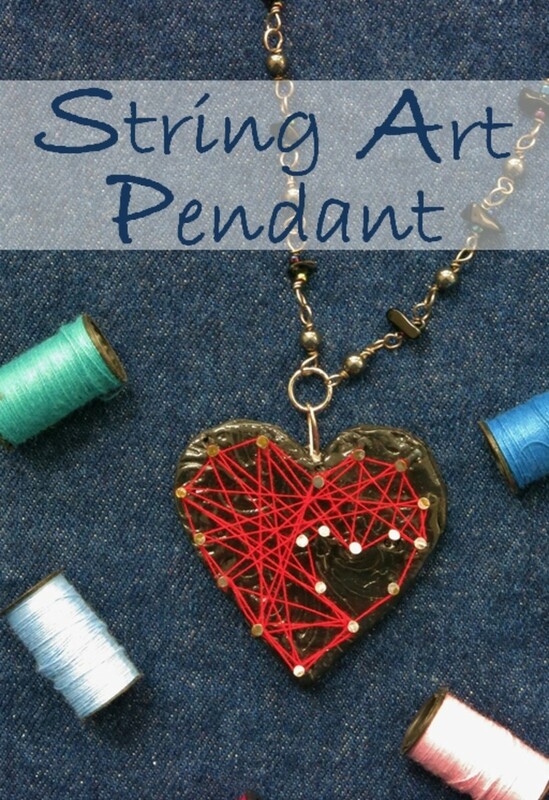 There's so many cool things you can make with string art, but given a choice, I always want to make jewelry! This pendant was fun to make, but took some patience. I'm looking forward to wear it. Thanks for your comment and your pin! Glad your enjoying my Pinterest boards - I spend way too much time there! Thanks, Rachel! This pendant is definitely unique. I'm sure your granddaughter would love one. I think I'll be making a few more to wear this summer. Thanks for your comment! Looking forward to your next hubs! Hi Donna, String art is really something different for me. I never saw it before. It has a very delicate and classic look to it. My granddaughter would love something like that. Thanks for showing your art. Way cute, with a retro vibe! I remember when string art was THE craft to do. Kind of reminds me of the Spirograph. :) Pinning. BTW, you have some amazing craft boards on Pinterest!